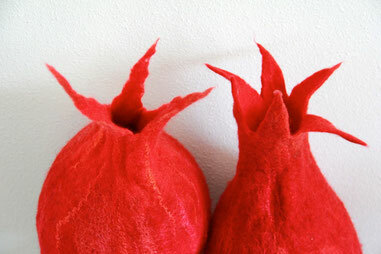 I make wearable felt art, like scarfs and ornaments. In this website you'll find movies showing my work. How to felt a lamp shade, how to make a curly scarf. Regularly I participate in exhibitions. In the movies below you find instructions to make a curly scarf and a colorful scarf. I made felt impression of nature; four seasons in the Onlanden.